Way back in 1770s, David Hume said, "For all inferences from experience suppose, as their foundation, that the future will resemble the past, and that similar powers will be conjoined with similar sensible qualities". James Hutton was studying geoscience, which was not yet a formalized field of study (doctorates would b given in geology many decades later). Still, he liked what he was doing and published books in the late 1700s, establishing uniformitarianism, summarized as "the present is the key to the past"; processes we see in geology today are the same as they've always been. Hutton influenced lawyer Charles Lyell, who expanded on Hutton's work. He wanted to save geology, "freeing the science from the old dispensation of Moses." When people like Lyell oppose the Bible, it's no surprise that they're willing to lie to promote their views. From here, failed medical student and backslidden clergyman Charles Darwin became excited by Lyell's uniformitarian-promoting, God-denying tomes. Through paganism, plagiarism, and his own observations, Darwin came up with his own version of evolutionism. Evolution demands long ages, and Darwin's Flying Monkeys© attack any evidence for a young earth with the fervor of MS-13 gang members. On the web and in paper, of course. When Mt. St. Helens reminded the world of its presence in 1980 (and not without warning signs by any means), geologists were justifiably excited about the opportunity to make observations, take measurements, and do scientist stuff. What they found is reminiscent of the Spanish Inquisition: nobody expected what was found! Even worse for views of Hutton, Lyell, and Darwin's supporters, this little volcanic explosion ("little" in comparison with other volcanoes) provided refutation for uniformitarian speculations and supported biblical creation science. Sure, they come up with excuses at the Darwin Ranch, but not much in the way of actual science to explain away the facts — especially the fact that the world was created recently, and not billions of Darwin years ago. 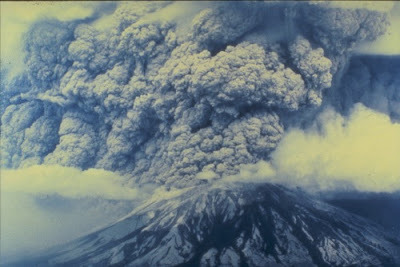 After decades of inactivity, Mount St Helens coughed to life in March 1980, some two months before its explosive eruption. Its smoke and rumbling were warning that something big was building up. Officials set up an exclusion zone around the volcano based on scientists’ ideas about how an eruption would occur. However, the blast was larger than expected, plus it first erupted sideways to the north instead of vertically. Of the 57 people that died, all but three were outside the exclusion zone.Wrong geological ideas can be deadly. Wrong geological ideas have also led people to wrong ideas about the Bible—that the events it describes were mythological and did not actually happen. Mount St Helens changed that, which is why I have been so interested in what happened. The eruption demonstrated that geologic catastrophe can produce in hours and days geologic features previously believed to have taken millions of years. When we see what the volcano did in such a short time, we can better appreciate how the catastrophe of Noah’s Flood formed the much larger geological features on planet Earth. To read the entire article, click on "Learning the lessons of Mount St Helens — How its eruption backs biblical history".